There is no change at the head of the Premier Division supported by Sportsform standings following wins for the top two clubs. Leaders Shefford Town & Campton won 6-0 at home against an Ickwell & Old Warden side who have now lost their last seven away games. Henry Snee netted four times to go alongside single strikes from Billy Cook and Kier Boyd. Second place Cranfield United took their winning ways up to five games with a 1-0 victory at Stevington thanks to a goal from Daniel Green. This defeat dropped Stevington from third to fifth following wins for Marston Shelton Rovers and Wootton Blue Cross. The Rovers now sit third after they made it four wins on the bounce in winning 2-1 at Crawley Green Reserves. Nicky Skolsky and Matthew Eddy were on the Rovers scoresheet against a lone home reply via Tim Akerele. Blue Cross are now fourth following their 3-1 home win over Wilstead. Scott Harvey with a brace plus a single goal from Jack Downes doing the damage against a lone reply via Ryan Davenport. The biggest winners of the day were Queens Park Crescents who won 10-1 at Caldecote. Chisom Amadi netted eight times alongside single strikes from Dominic Parrella and Shay Fenlon against a lone home reply from Callum McCoy. Also enjoying life on the road were now eighth place Riseley Sports who took their winning ways to four games in winning 4-2 at AFC Kempston Town & Bedford College who have now failed to win any of their last six home encounters. Josh Poole with a brace plus single strikes from Mitchell Crook and Jack Healey marked the Sportsmans scoresheet against a Town brace in reply from Ben Browne. Flitwick Town, following two straight home defeats, returned to winning ways on home soil with a 5-3 victory over AFC Oakley M&DH. Phil Matthews with a brace plus single goals from Florin Filimon, Ritchie Bevan and Peter Rogan brought up the Town nap hand against M&DH replies via Joel Ives twice and Ali Smith once. League leaders Bedford Albion are now without a win from their last three games after being held to a 2-2 draw at Christians in Sport (Luton). Paul Douglas and Adam Oliver netted for the home side against Albion replies via Adan Lewis and Jessie Sidhu. Whilst after failing to fulfill their fixture last weekend second place Wixams this weekend won 2-1 at AFC Kempston Town & Bedford College Reserves to end the Town’s four game unbeaten run. Kirk McKinley and Connor Saunders netted for the visitors against a Town strike from Daniel Riddaway. With third place Biggleswade FC Reserves away on Centenary Cup duty Cranfield United Reserves failed to jump above them when their five game winnning home run was halted in being held to a 1-1 draw by Totternhoe Reserves. Joe Sames was on the United scoresheet with Archie Taylor replying for the visitors. Also sharing the spoils were Lea Sports PSG and The 61 FC Luton Reserves in a 2-2 draw, George Nivan and Silvinho Unjanqua on the PSG scoresheet against 61 replies via Dylan Gittens and George Onwusonye. Elsewhere, there was a gift of three points for Flitwick Town Reserves after Sandy failed to raise a side to journey and meet them at the Football Centre and likewise Cople & Bedford SA received three points after Wilstead Reserves failed to raise a side to entertain them at Jubilee Playing Fields. Biggleswade FC Reserves reached the final of the Centenary Cup after a 4-3 win at Henlow on Saturday. They will now face a final against either Shefford Town & Campton Reserves or Cople & Bedford SA, their tie of last weekend now subject to an league appeal. The visitors got off to a flyer with goals from Kian Coles and Oscar Smith inside the opening seven minutes before, on the half-hour mark, James Campbell reduced the arrears to give the home side hope. Those hopes looking more unlikely after Alex Toye was given a second yellow card and his marching orders just two minutes before the break and even bleaker when John Veal put the visitors 3-1 ahead in the 58th minute. However the home side were far from ready to lie down and when Piers Le Grand netted four minutes later to make it 3-2 it was game back on. Alas for them in the 73rd minute Cian Mitchell made it 4-2 to to in effect book their finals spot as James Cambell’s second of the afternoon deep in time added on was a mere consolation. Elstow Abbey are now back onto the top of the Division Two suported by Hy-Pro league after they retained their unbeaten ways and made it 10 wins on the bounce with a 2-0 home victory over Atletico Europa who were losing for the first time in 10 away encounters. Jason Allison netted both of the Abbey goals. Losing out on that top spot were Houghton Athletic after their game at CS Rovers was postponed following a pitch booking error. Athletic remain in second spot after third place Meltis Albion saw their home encounter with Luton Leagrave AFC abandoned five minutes from time and is ow subject to a Beds FA and league enquiry. The visitors at the time were leading 3-0 following goals from Hartley Coleman, Ryan Hill and Lewis Bloomfield. The biggest win of the day belonged to Caldecote Reserves who, following four straight defeats, bounced back to form with a 7-0 away win at Marston Shelton Rovers Reserves who have now lost their last seven games. Carl Heath netted four times, Adam Legate twice and George Kyle once. Also hitting seven goals on the road were Sporting Lewsey Park in winning 7-1 at M&DH Clapham Sports to take their unbeaten ways up to seven games. Mano Langlais with a hat-trick was joined on their scoresheet by braces from Luke Lincoln and Chris Gibson, Bert Kiemmer netting the lone home goal. Also enjoying life on the road were Clifton who returned to winning ways for the first time in four outings by winning 4-2 at AFC Oakley M&DH Reserves. Michael Hall, Charlie Watson, Jose Carles and Liam Chalkley were on their scoresheet against a M&DH brace in reply via Joe Mcdonagh. Sundon Park Rovers are now without a home win in their last 10 starts and Unite MK Reserves without a win in their last 10 after they shared the spoils in a 1-1 draw. Farai Dutiro netted for the Rovers and Mohammed Ismail Raja replying for Unite. 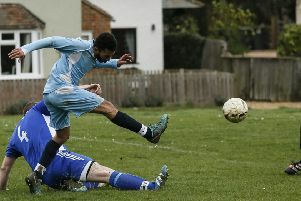 St Joseph ( Saturday) made it three home wins on the bounce in beating Black Swan ( Luton) 3-1. Aaran O’Brien, Kieran Carey and Simon Richards were on the home scoresheet against a lone Swan reply via Kieran Archer. For league leaders Pines (Luton) it was an end to their 100% home record and just a second league defeat of the season when beaten 2-1 by Real Haynes who were chalking up win number five on the bounce. Harry Mabbitt and Tyler Winter were on the winners scoresheet against a home reply via Connor Blennerhassett. Third place Bedford Albion Reserves needed just a Stefan Bucur goal to gain all three points in a 1-0 home win over Wootton Village. For fourth place FC Polina (Luton) it was a return to winning ways for the first time in five outings when winning 2-0 at Real Haynes Reserves, Tomasz Marczewski and Damian Slawkowski netting the goals. Whilst fifth place Shefford Town & Campton A won 2-1 at sixth place Thurleigh. Josh Holland and Ross Cook were on the Town scoresheet against a lone home reply via Bradley Raines. Also winning on the road were seventh place Harlington Juniors who took their winning ways up to four games with a 3-2 victory at Lidlington United Sports. Luca Flantellizzi, Darren Bryan and Owen Davison were on the visitors’ scoresheet against a home brace in reply from Mark Reynolds. Whilst after five straight home defeats Flitwick Town A returned to winning ways in beating Dinamo Flitwick 3-1 – Charlie Collier, Tom Bates and Gareth Loadman netting for the Town against a Dinamo reply via Dale Goldie. Wixams Wanderers were 3-1 home winners over Square FC. Michael France with a brace plus a Tom O’Neill goal marked the home scoresheet against a lone reply from Josh Moffatt.